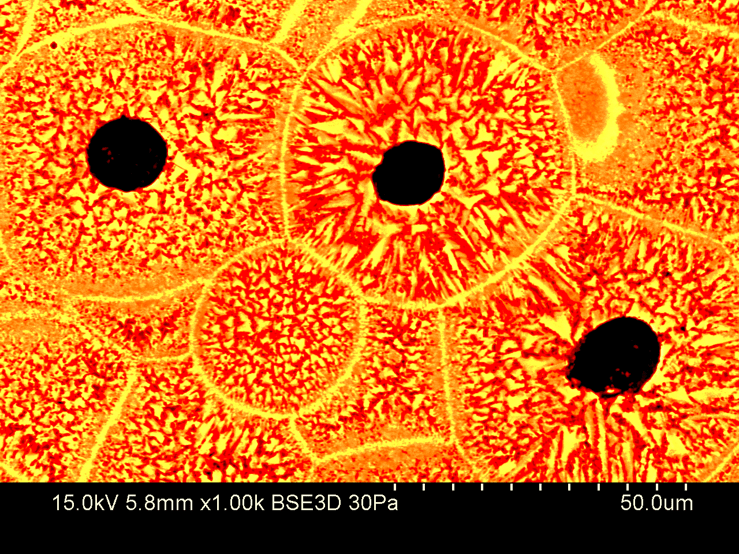 The MCF hosts a running image contest that resets monthly. 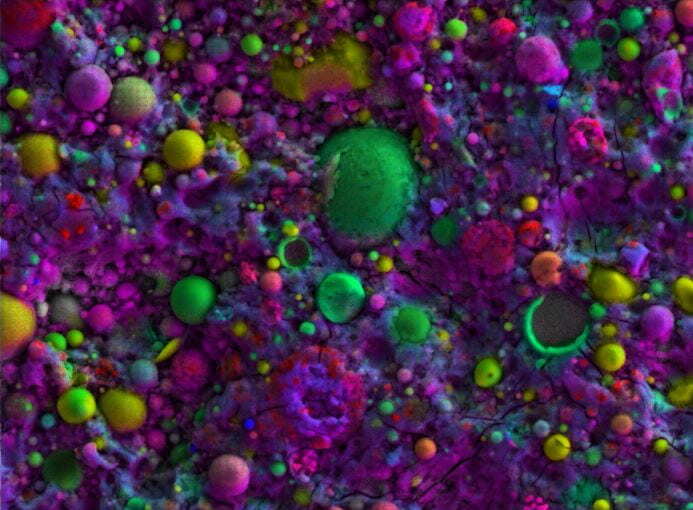 In addition to displaying some of the imaging and analysis capabilities of our labs, it gives our users a chance to display their creative side. 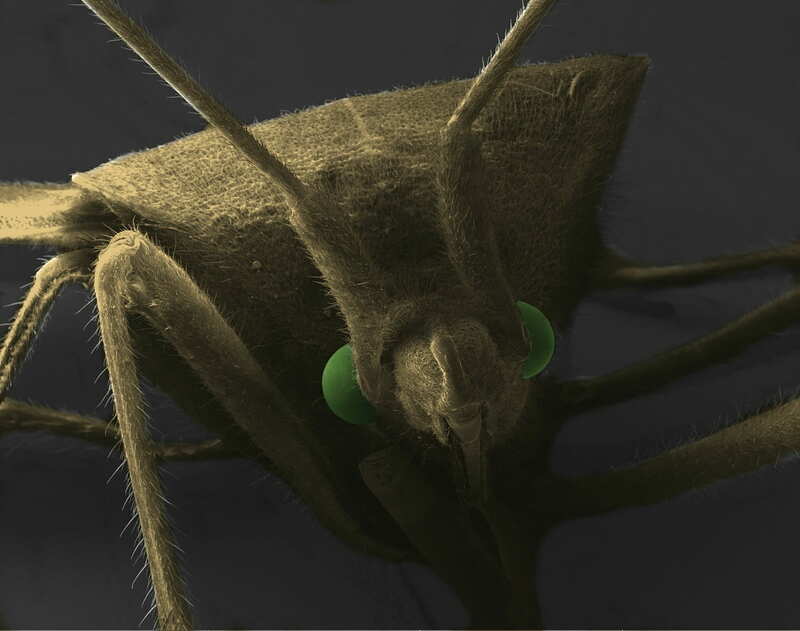 Check back here the first week of each month for updates on monthly awardees and twice a year – around mid-January and mid-June – to see the semiannual grand prize winners. 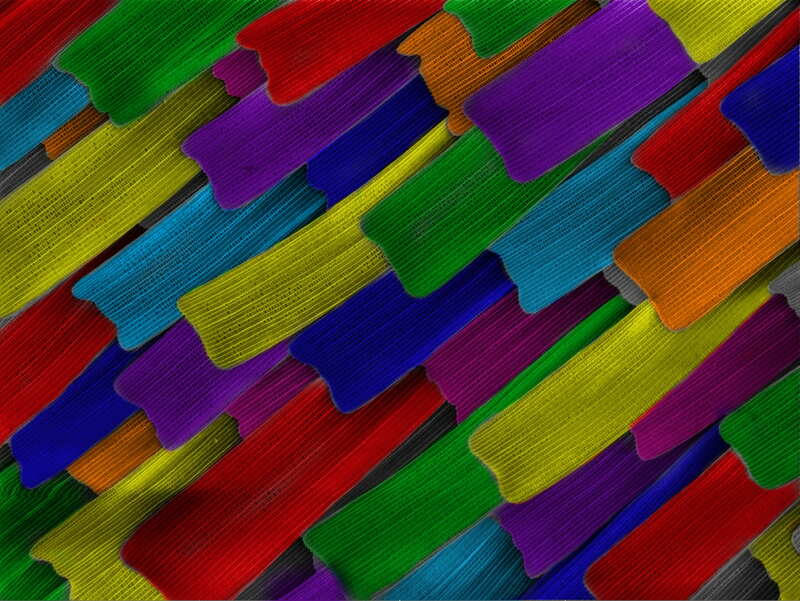 If you are an MCF user, then check out the contest rules here and please consider submitting. 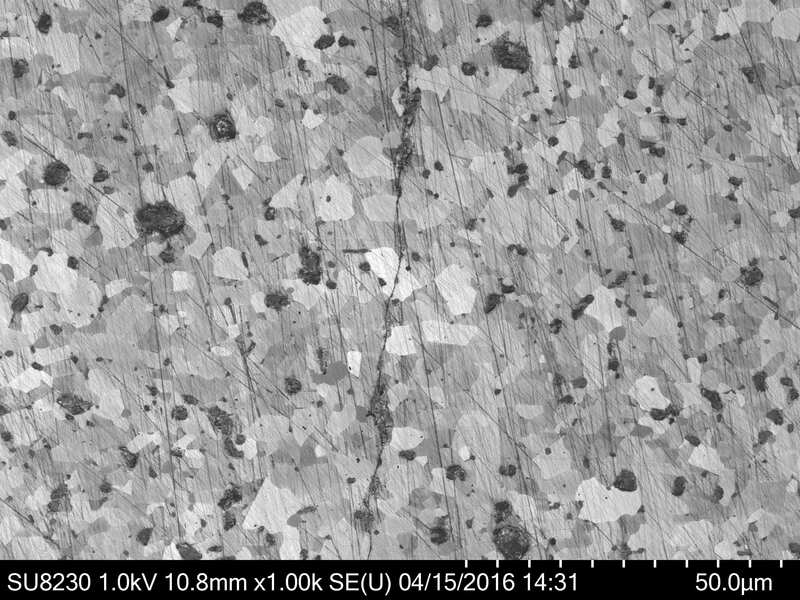 Inconel 718 (polycrystaline nickel superalloy) in the final cycle of a fatigue crack growth test. 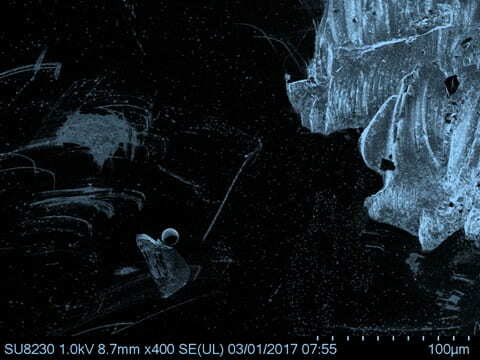 Image captured on Hitachi 8230 by Prasanth Alapati. 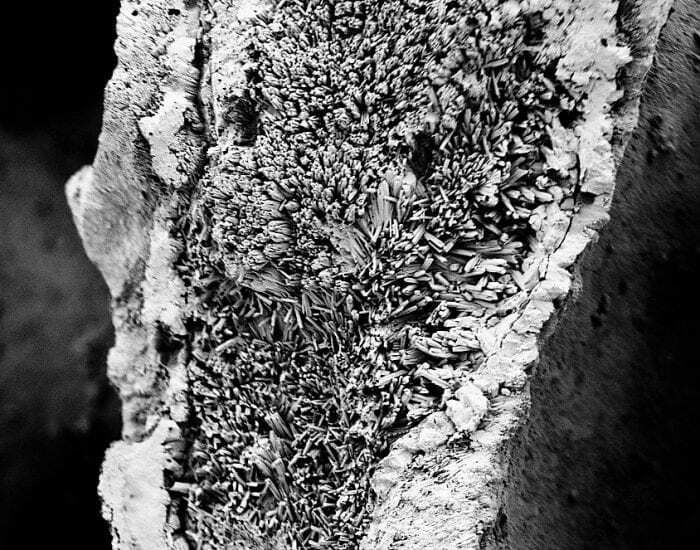 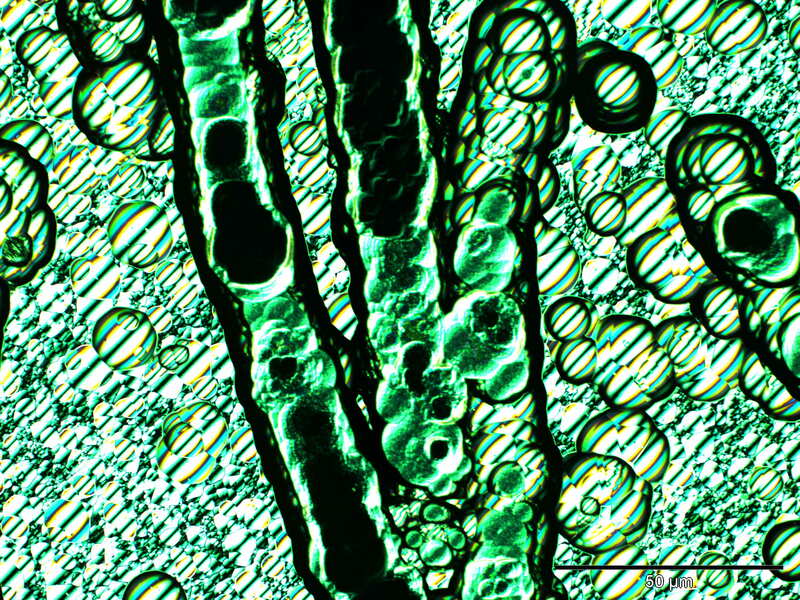 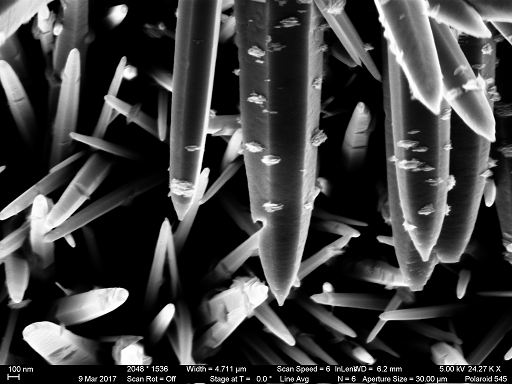 Overgrowth of zeolite crystals on membrane surface crystallizing in a needle shaped morphology. 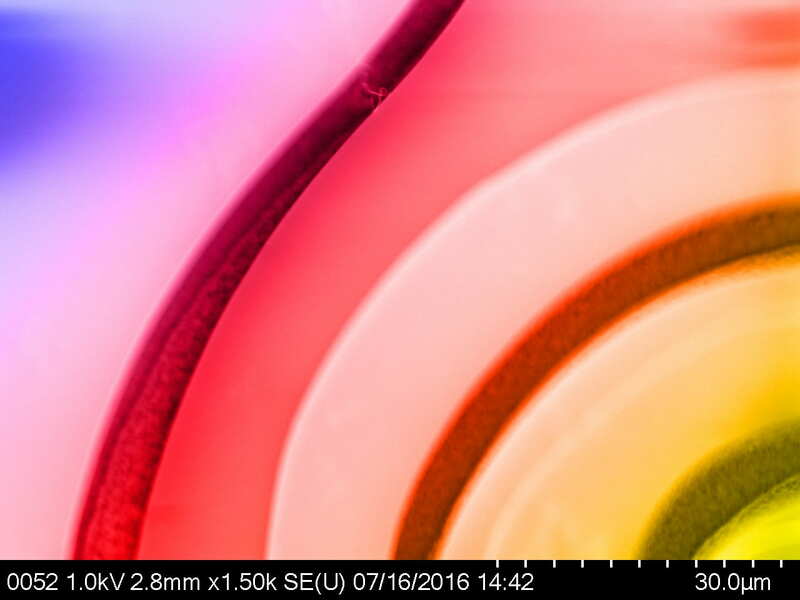 Captured on Hitachi8010 by Akshay Kord. 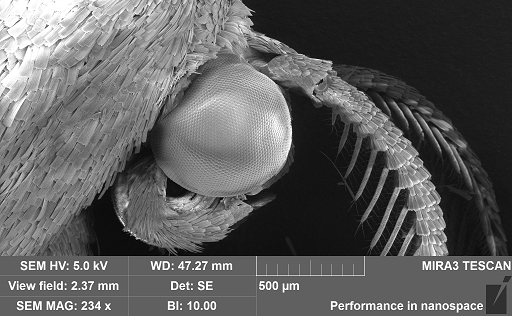 Fly Wing captured by Eleanor Brightbill and Katie Young on Keyence VHX-600 Digital Microscope . 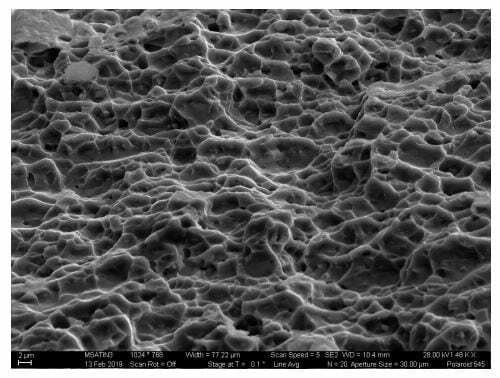 Prepared with Ga-induced liquid metal embrittlement. 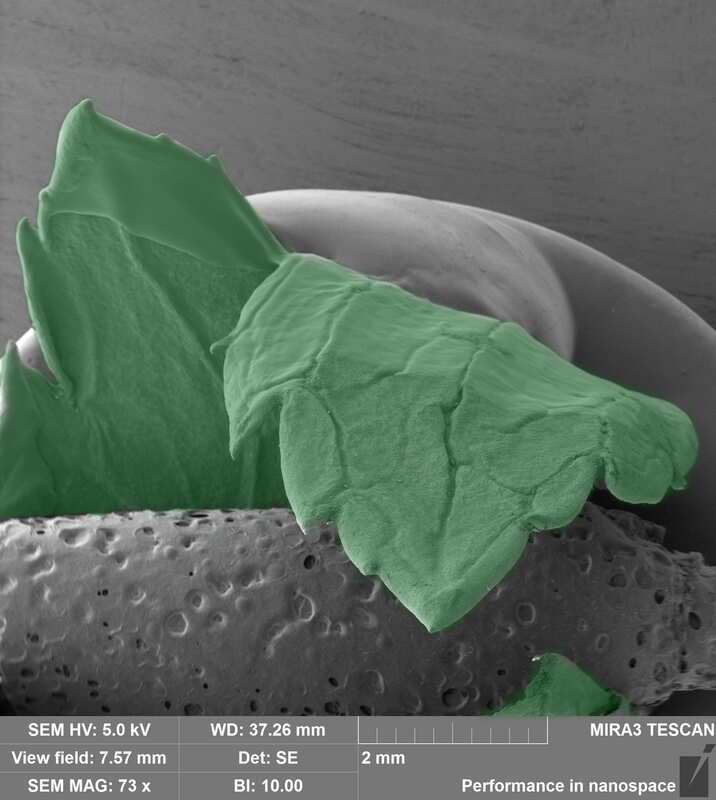 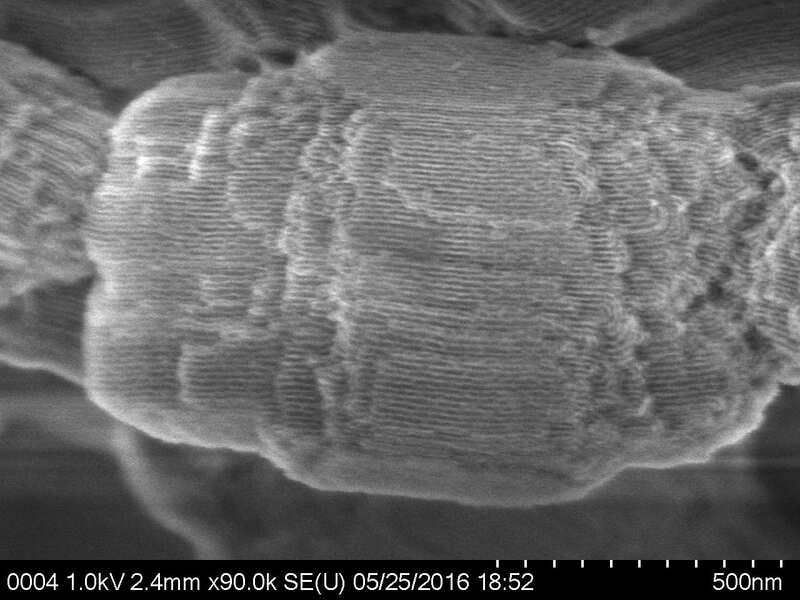 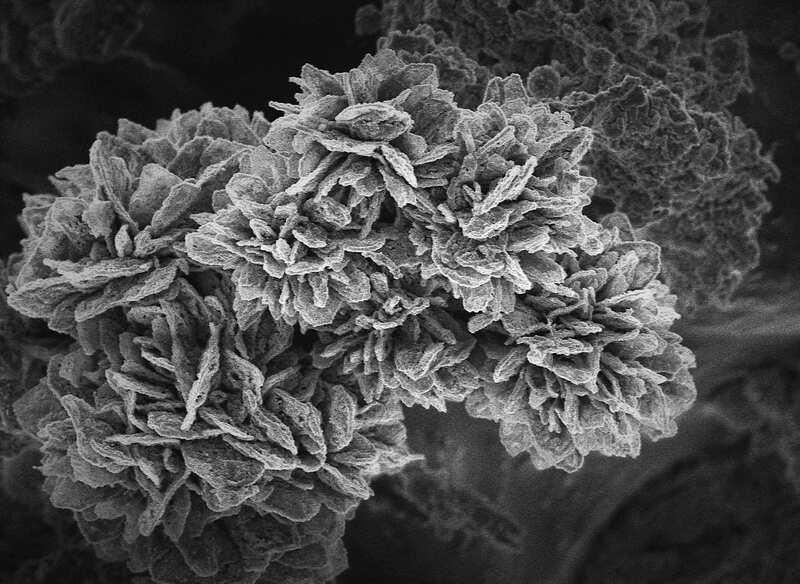 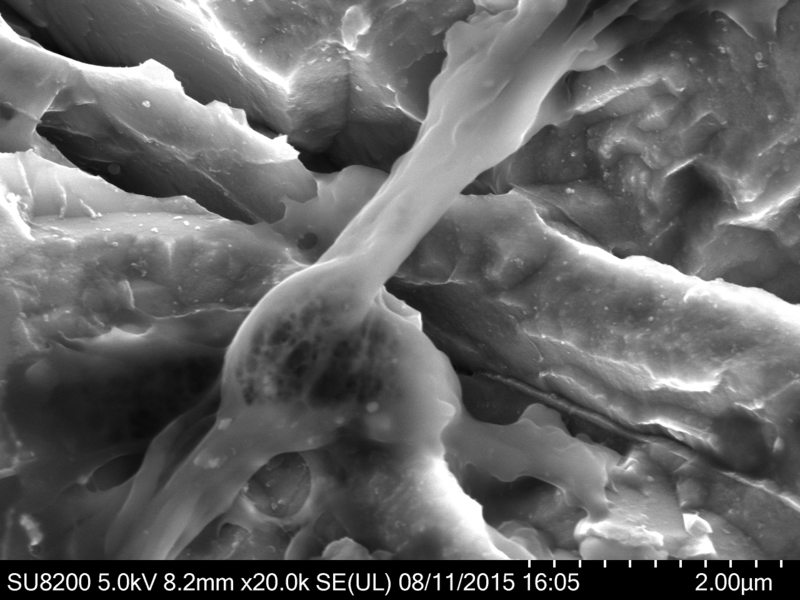 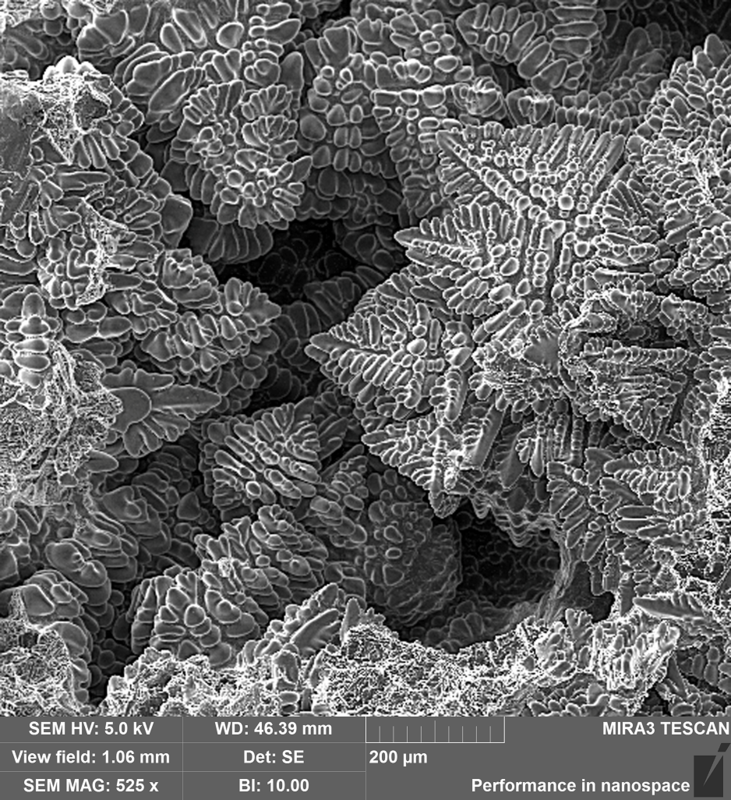 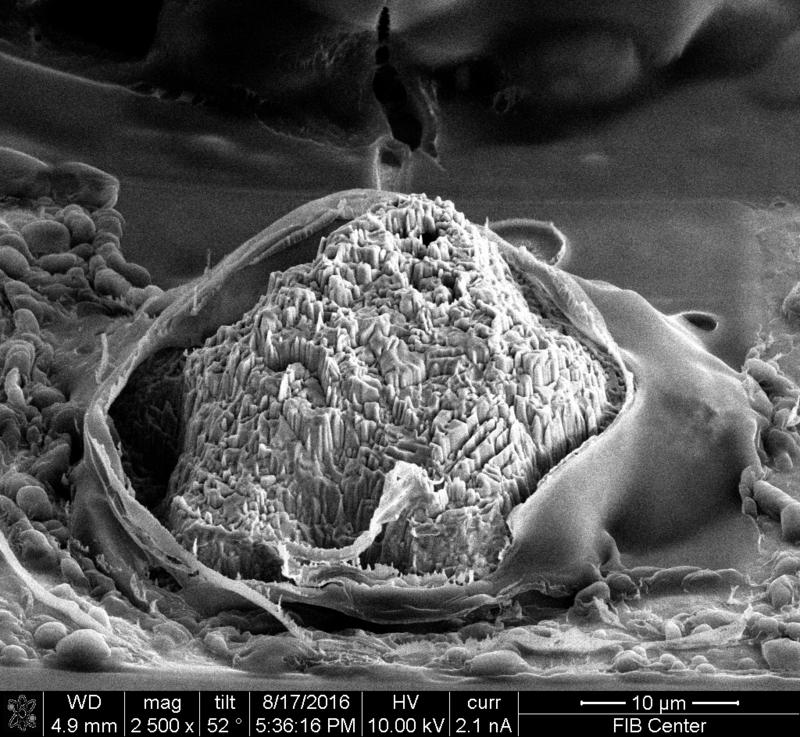 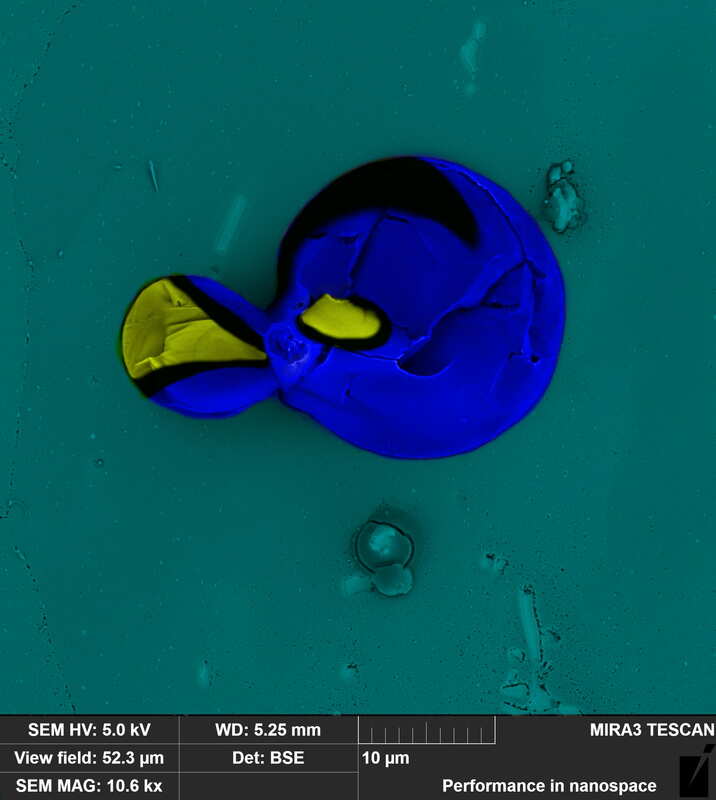 Image captured on Hitachi 8010 SEM by Xueqiao Wang. 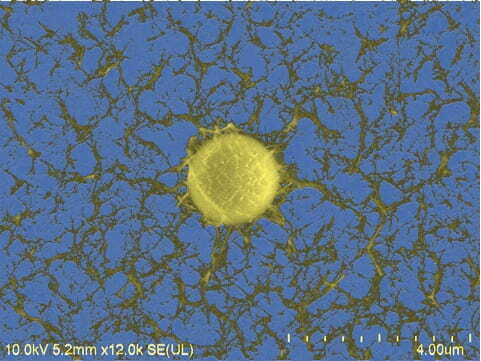 Al Dendrites: Dendrites formed inside a shrinkage porosity during solidification of A365 aluminum alloy. 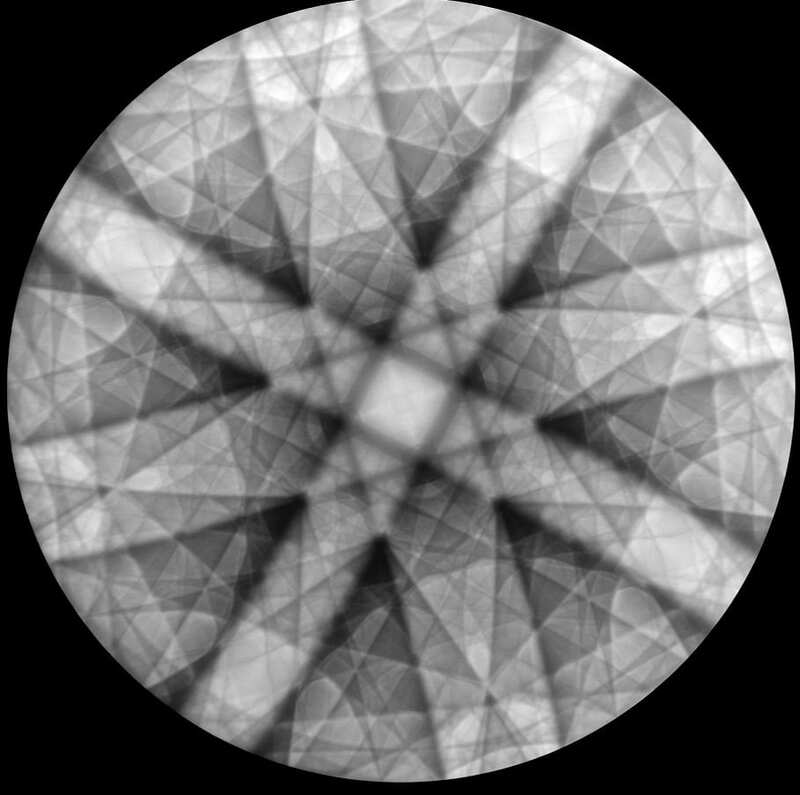 Image of the diamond tip of a scoring tool used for investigating machining damage on multi-cast and single crystal Si samples. 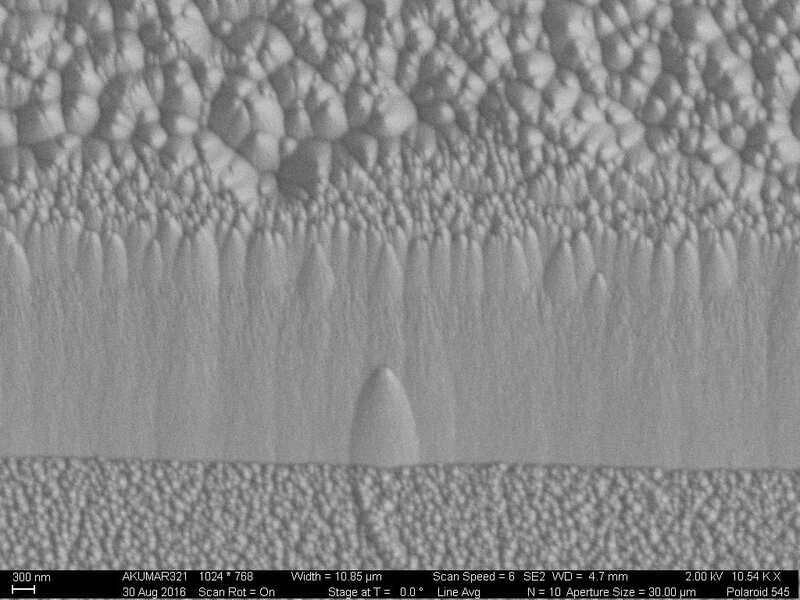 BaTiO3 Sunspots This is an image of sintered barium titanate silicate glass microspheres that crystallized during sintering. 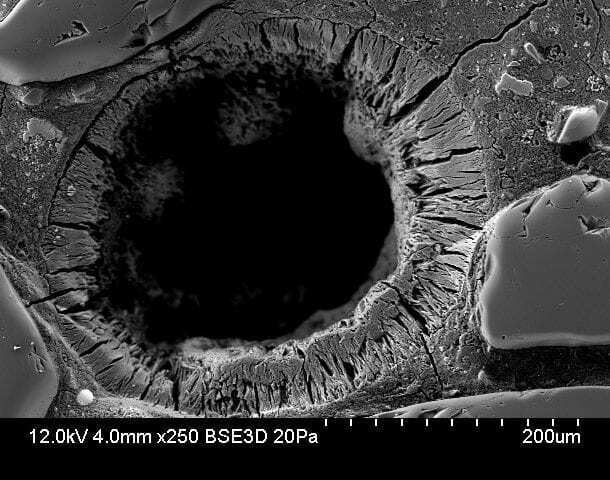 Crystallization initiated at the glass particle boundaries and amorphous glass was pulled from the centers of the larger grains leaving the voids which appear as the “sunspots”. 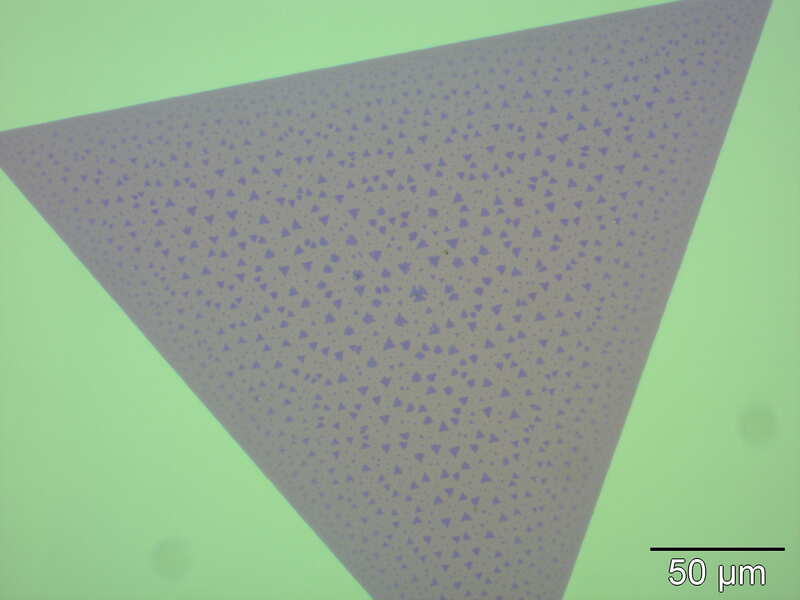 The contraction on crystallization also formed the “shattered glass” pattern since the denser crystalline regions can no longer fill all the available space within the microspheres. 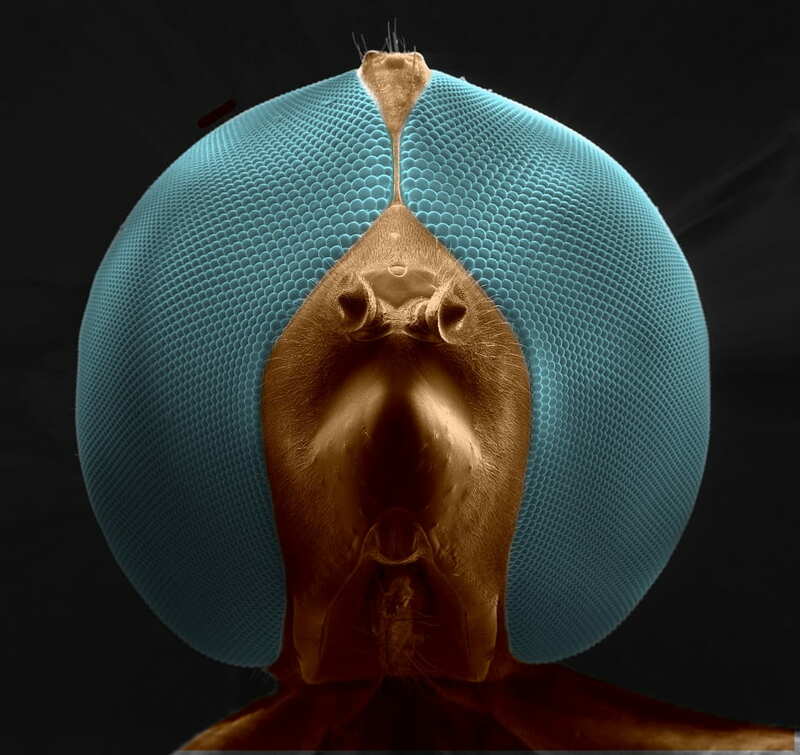 Seeing Tech Everywhere U Look Image of a hoverfly’s compound eyes. 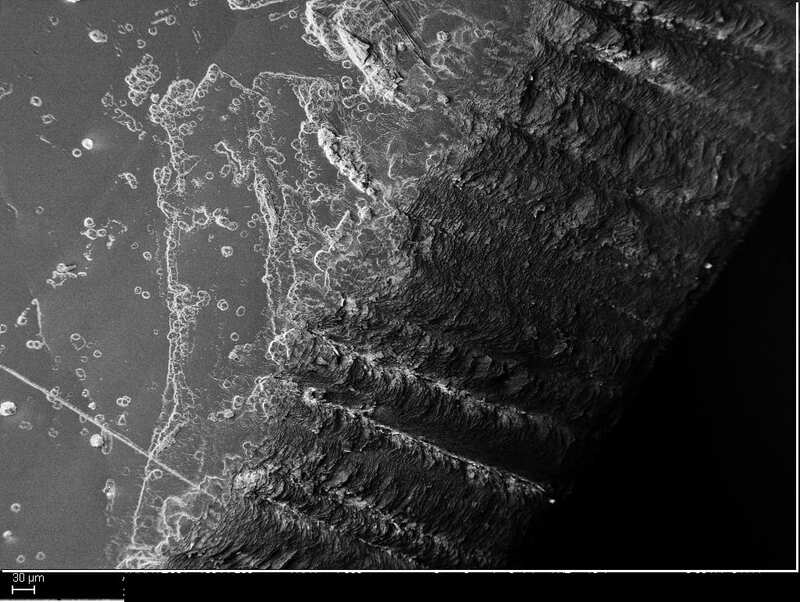 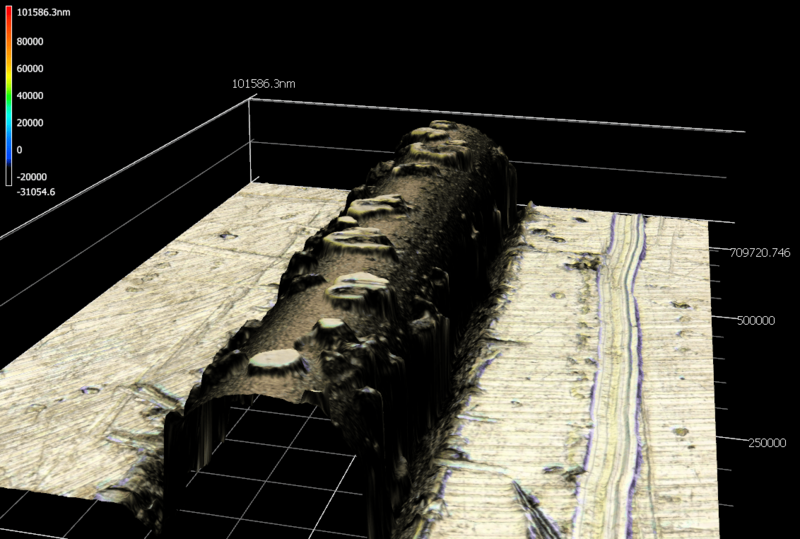 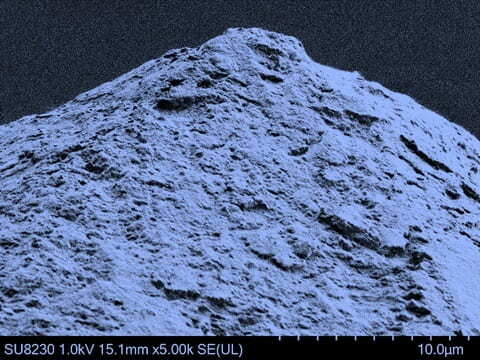 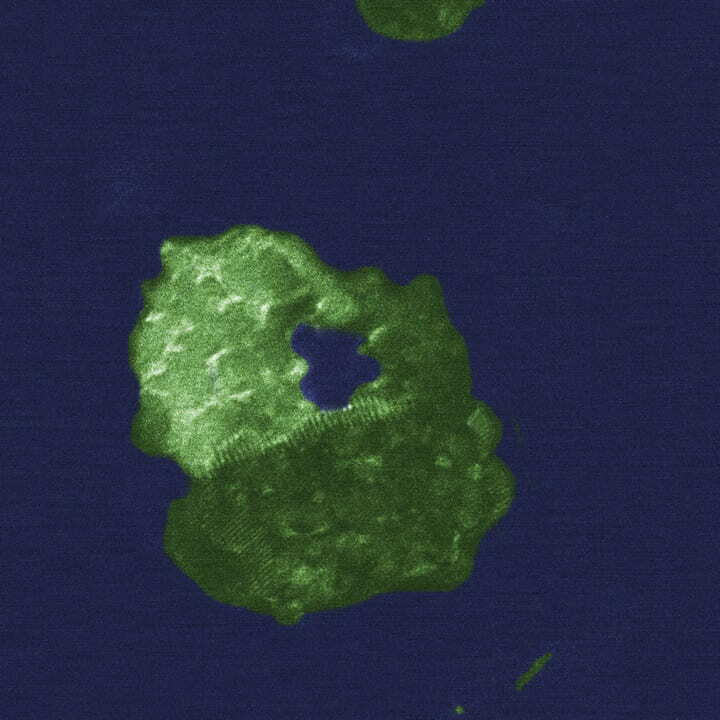 The sample was coated with a 2nm thick gold layer enabling the sample to be imaged using a standard SEM. 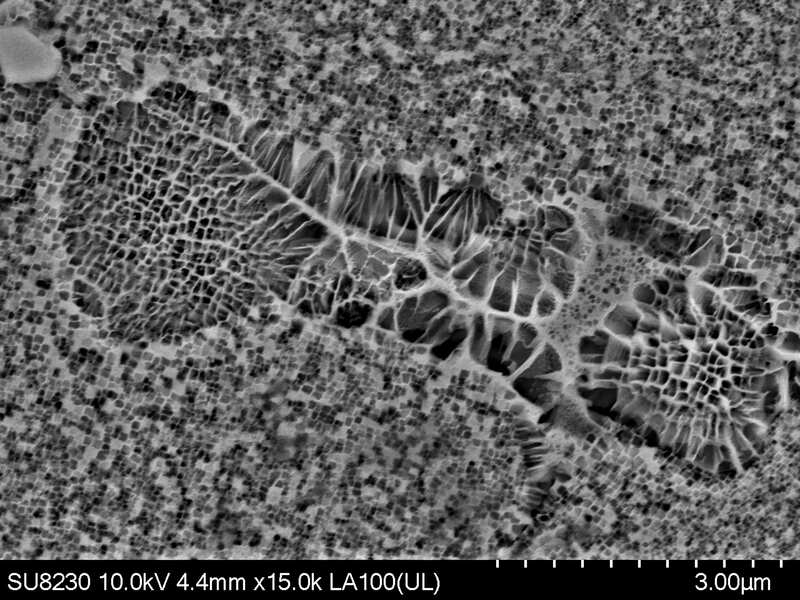 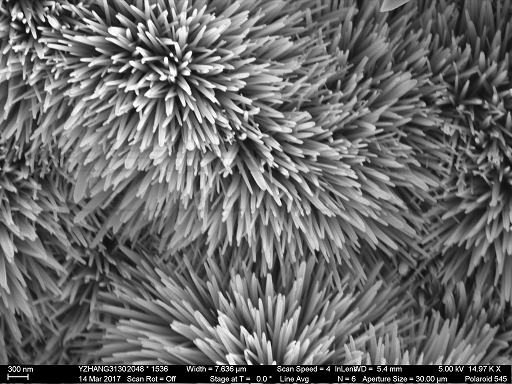 ZnO nanorods on Fe foil substrate. 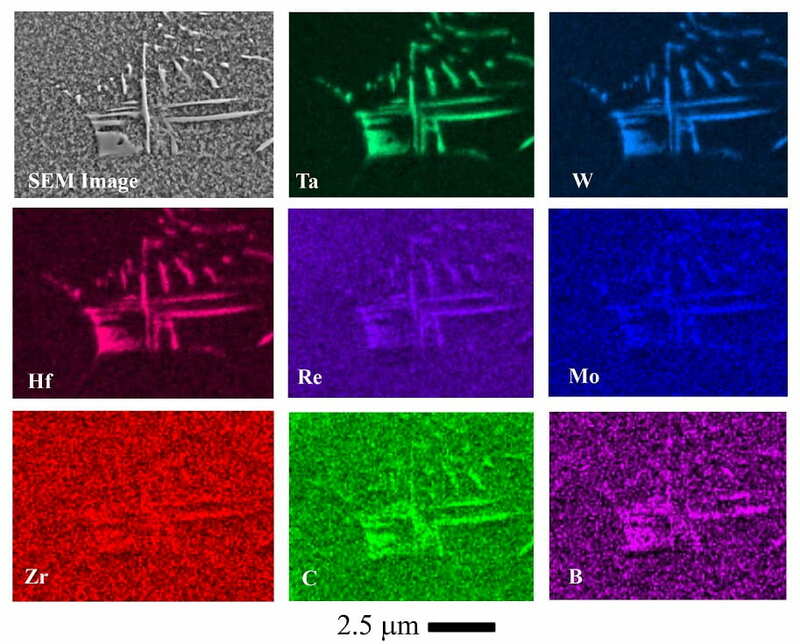 superalloys that are typically found to be Ta-rich. 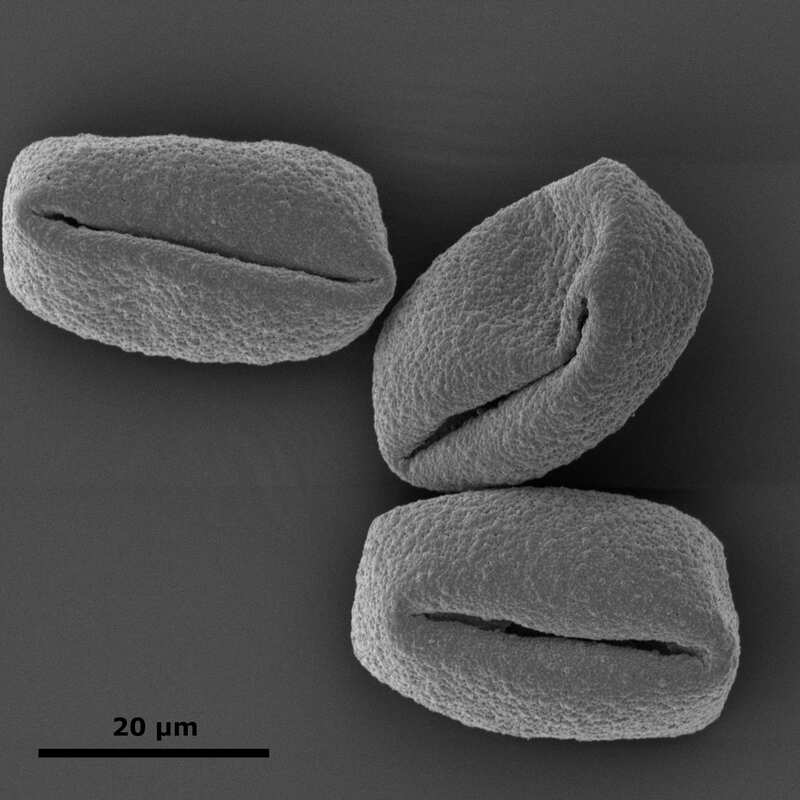 during cooling cycle from a high temperature. 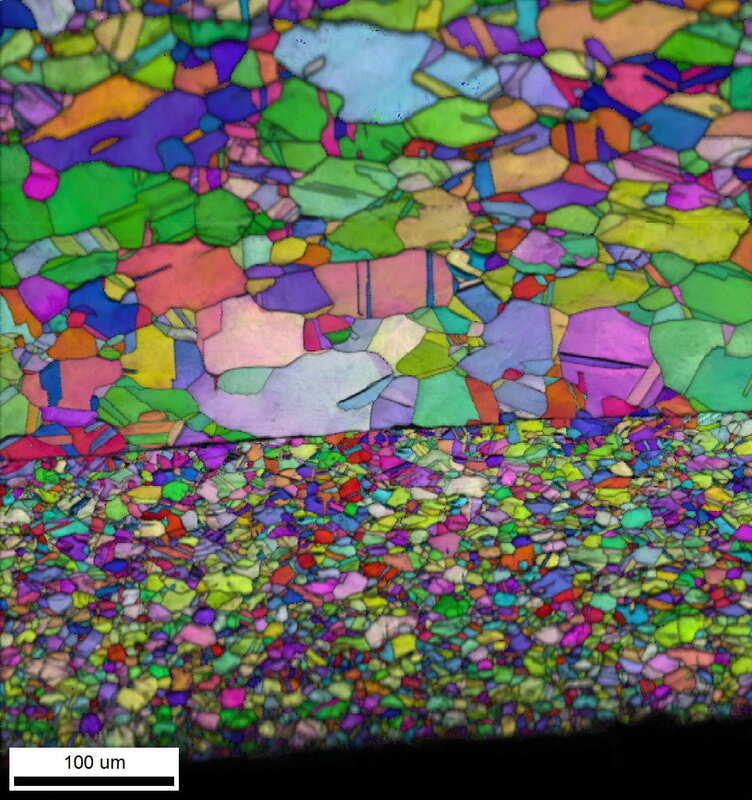 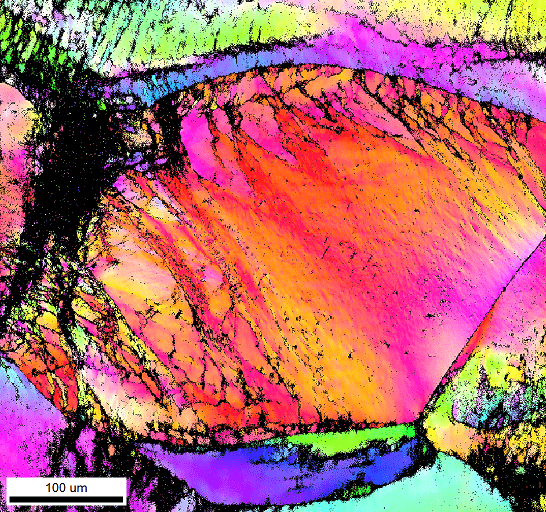 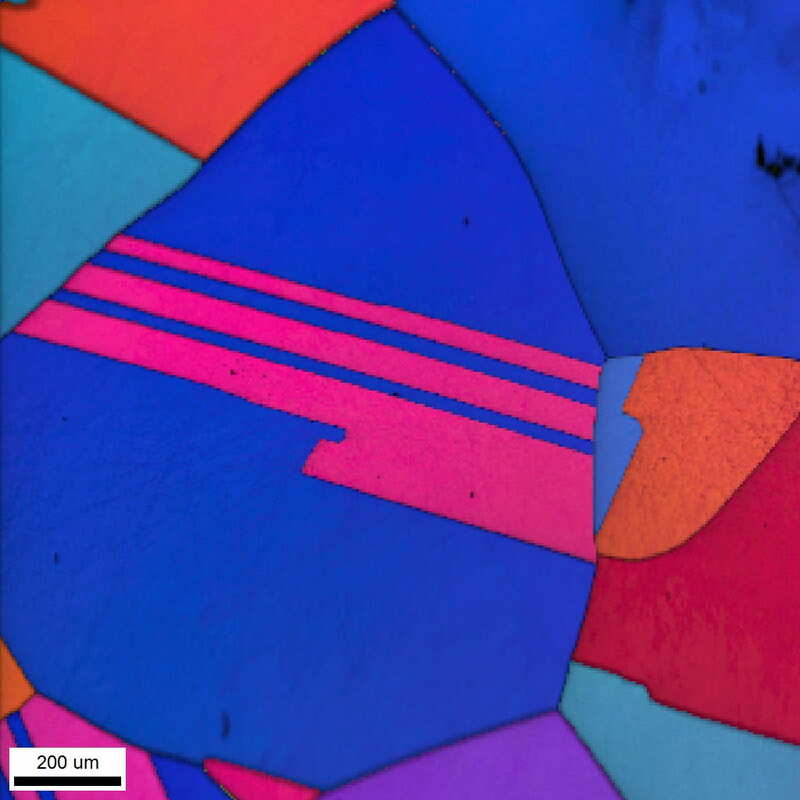 The EBSD technique is capable of measuring crystal orientations of a material at very high spatial and angular resolution. 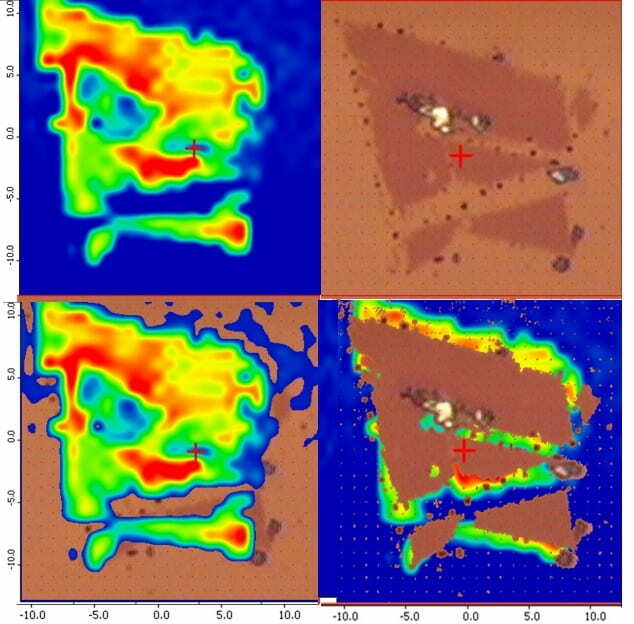 This montage shows STEM images of MoS2 samples. 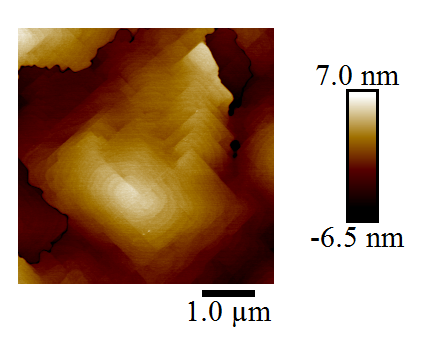 At upper right and lower left the honeycomb “texture” in the images is the atomic structure of a monolayer-thick flake of MoS2. 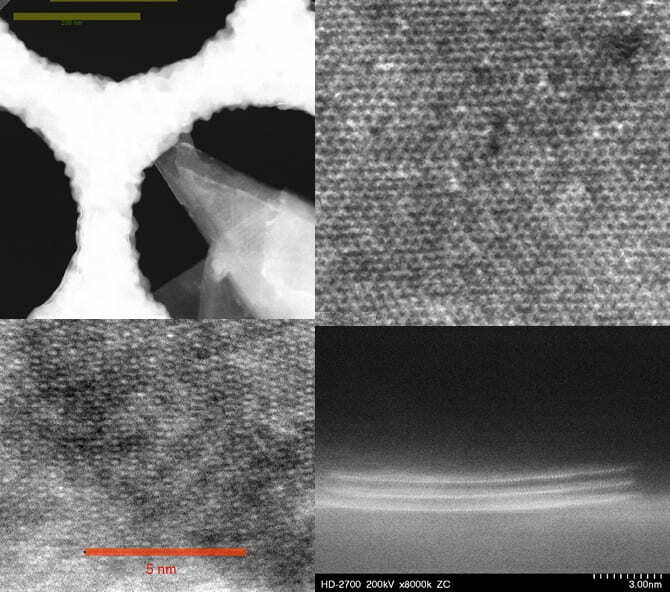 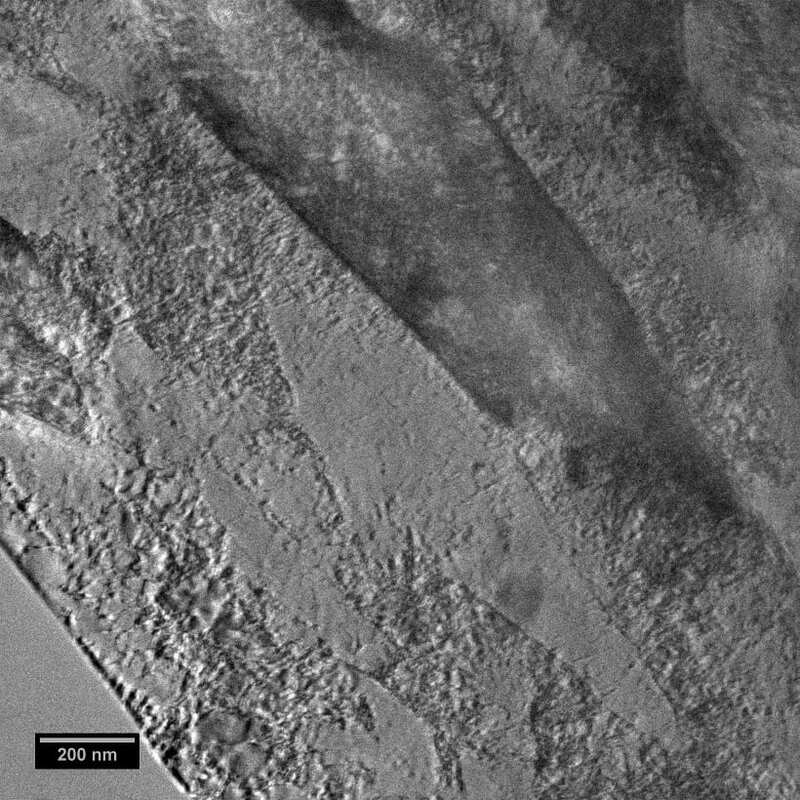 The upper left image shows a zoomed out view of a folded MoS2 flake on a TEM grid, while the lower left image shows an edge-on view of a tri-layer flake with the atomic columns visible as small bright dots . 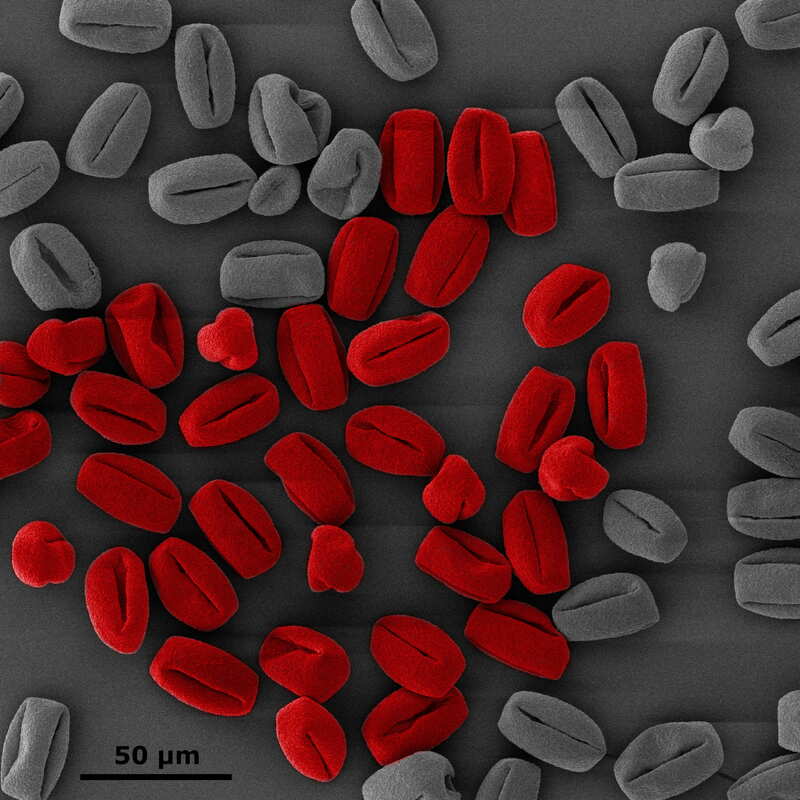 These were originally tin particles mixed with two types of polymer (CMC and PMMA). 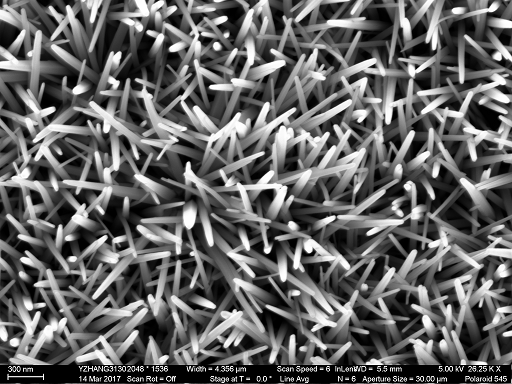 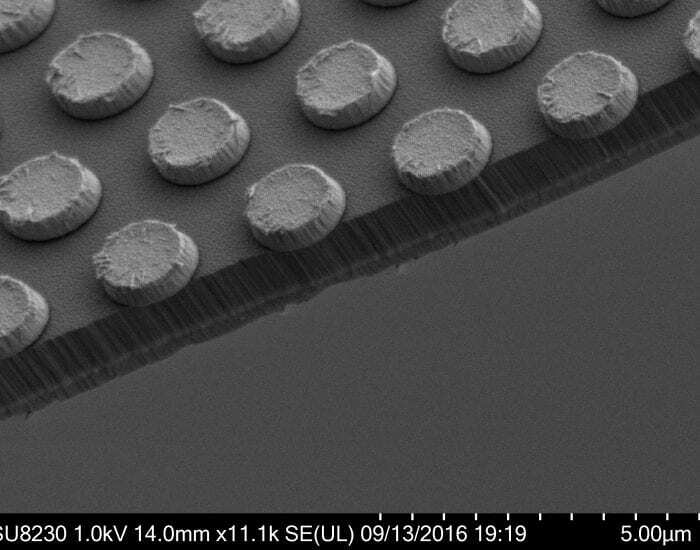 Then, we dissolved PMMA nano spheres to create nanoporous thin film for energy storage applications. 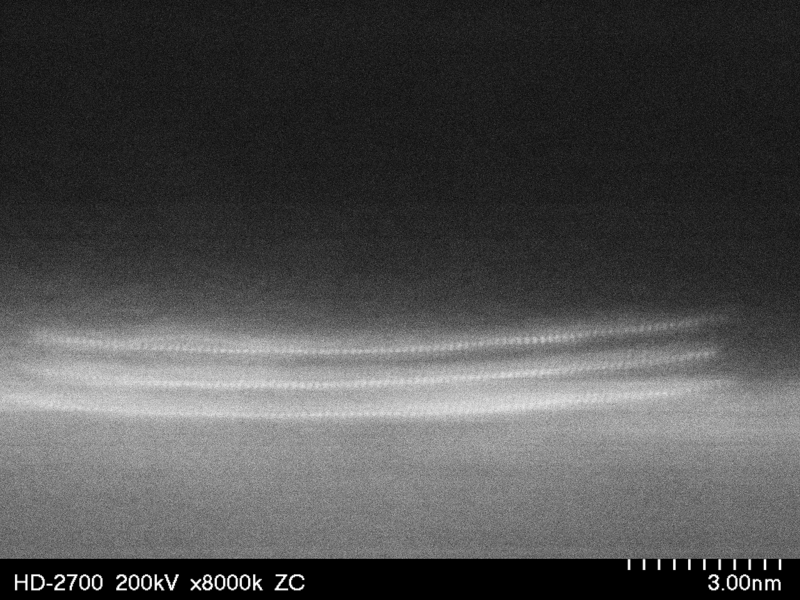 Even when imaged at very low voltage with electron deceleration to guard against beam damage, we are still able to resolve features smaller than 10nm. 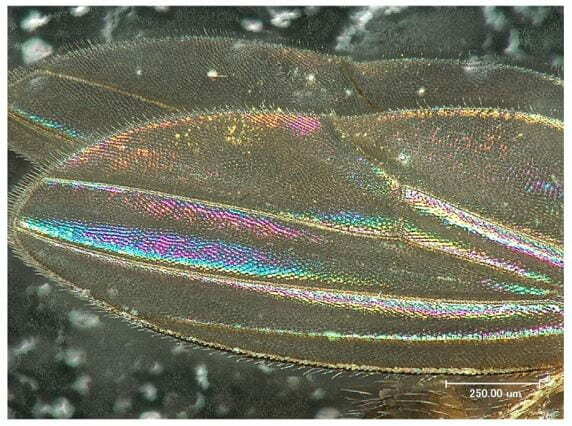 of scales make the wing very light despite its size. 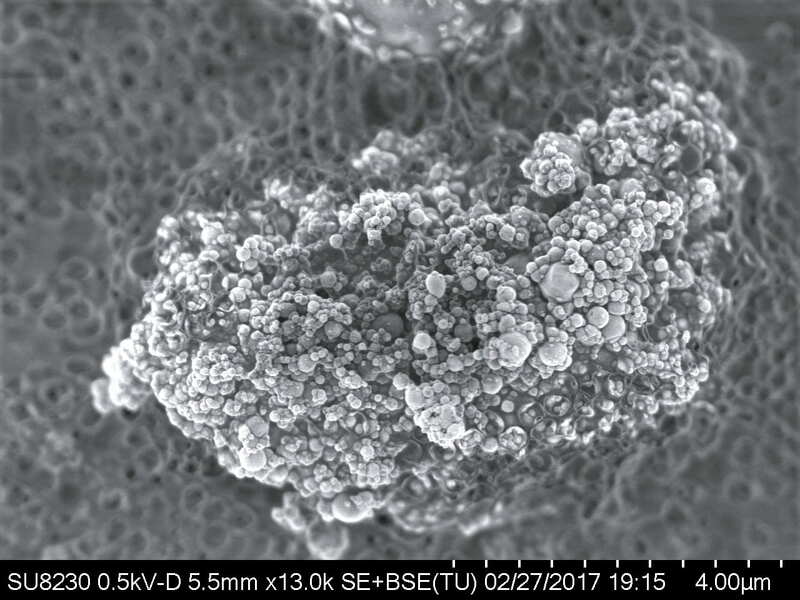 The structure illustrates how lighter, softer materials (i.e., not metals or concrete) can be used to generate strong resilient structures. 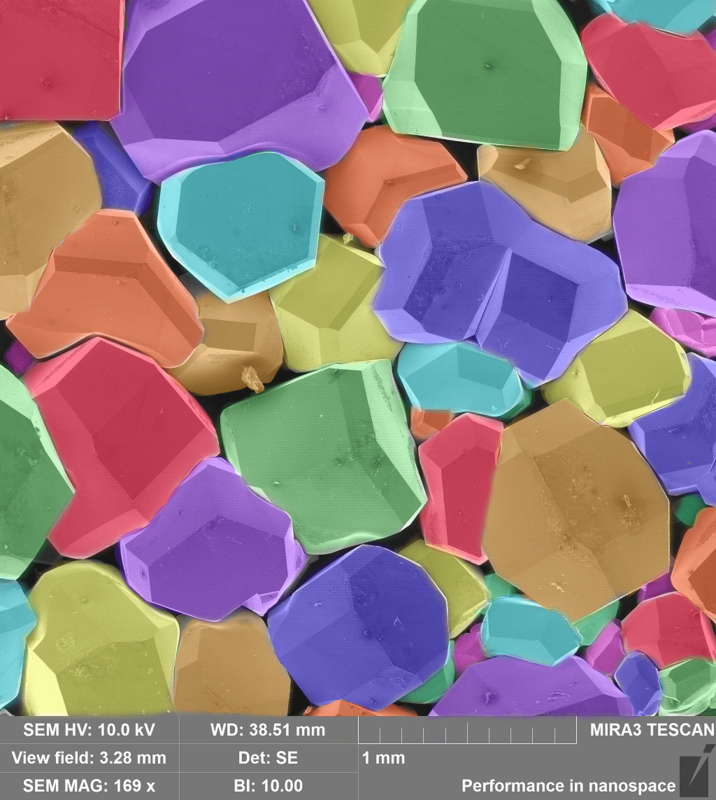 appearance with very different colors – like jewels in a mine. 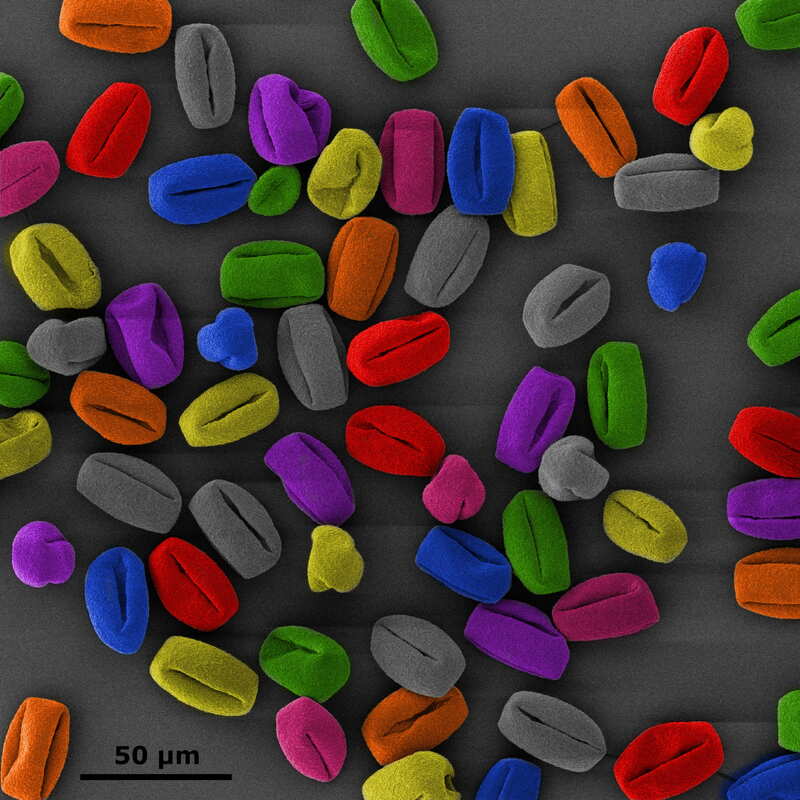 A vertical array of CNT’s is grown beneath a thin layer of SiO2 that coats the catalyst. 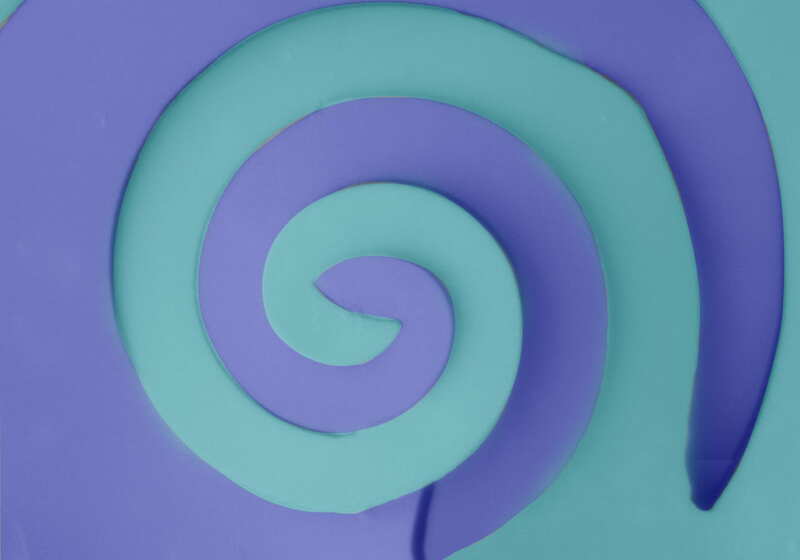 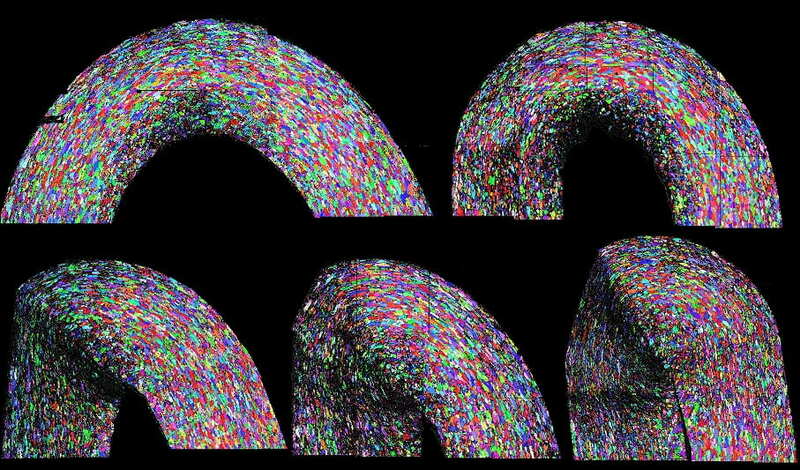 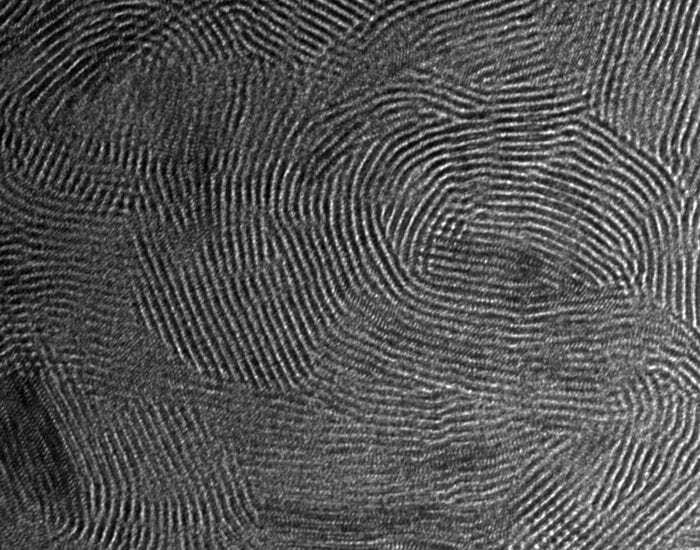 Deformation of SiO2 during the growth process causes the CNT array to form majestic Archimedes spiral patterns. 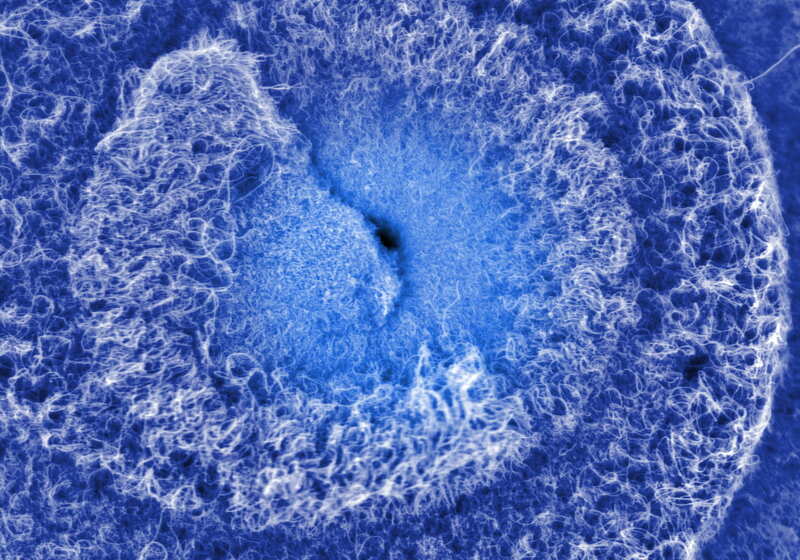 The growth of these spiral patterns, which are observed after the SiO2 is removed, has not yet been fully explored. 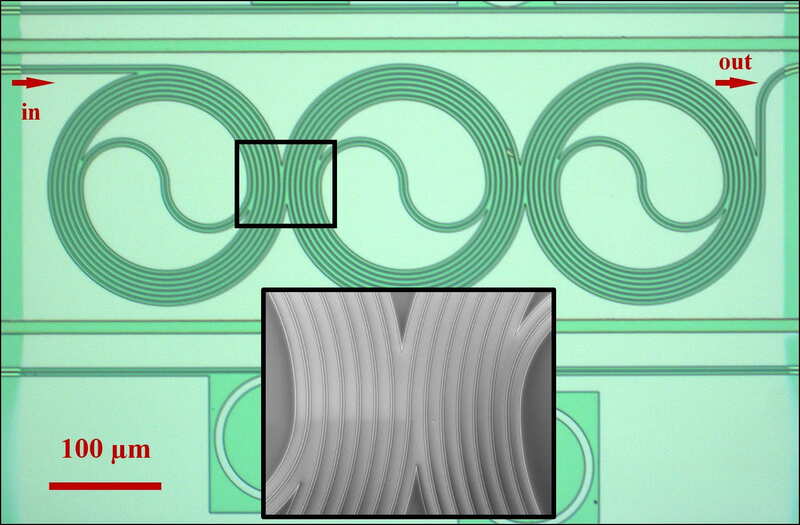 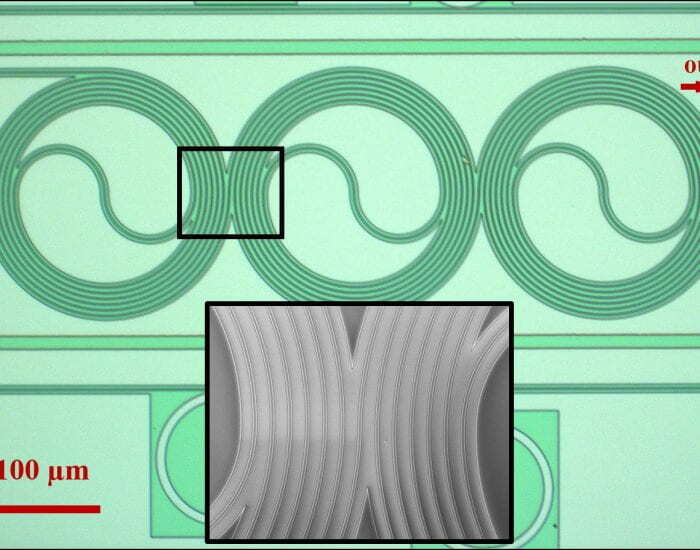 The CNTs will be used in optical rectenna devices for energy harvesting and high frequency applications. 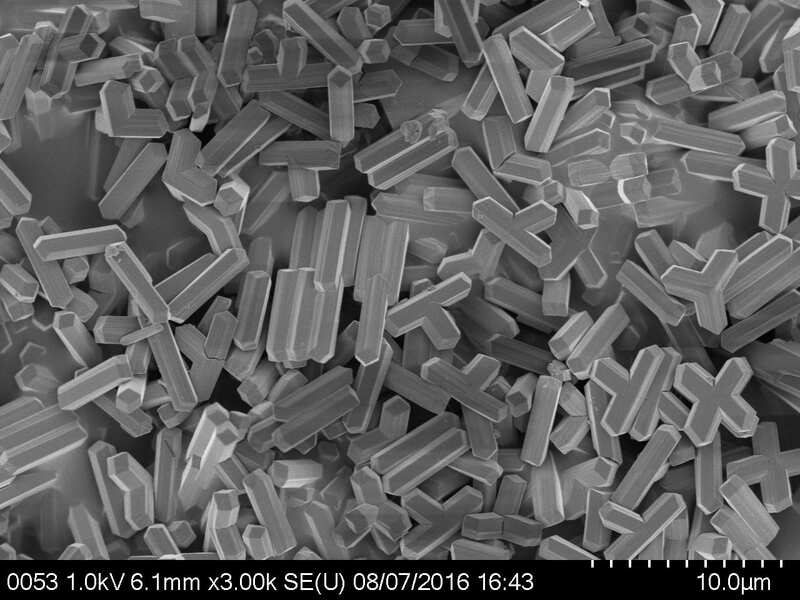 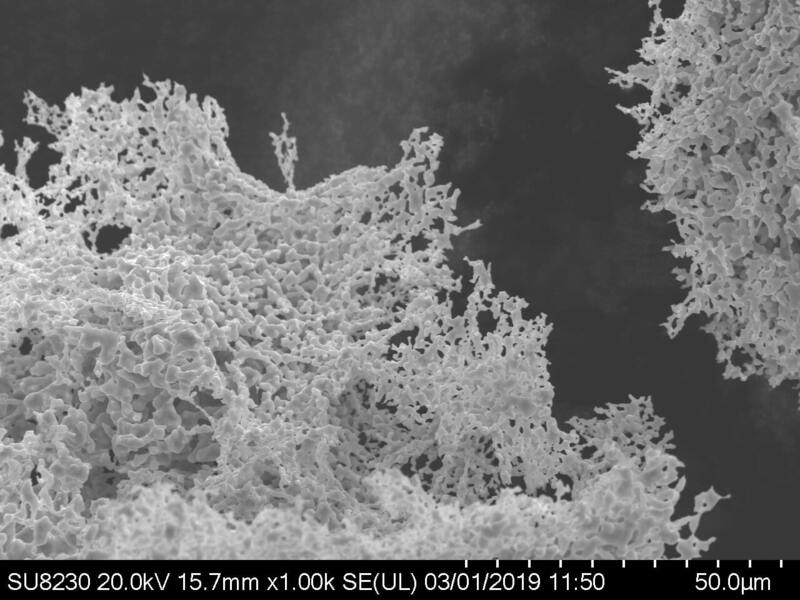 Through careful control of synthesis parameters such as temperature, solvent, and modulating ligands, these monodisperse micron-sized rods of ZIF-7, a metal-organic framework, can be grown in high quantity and yield. 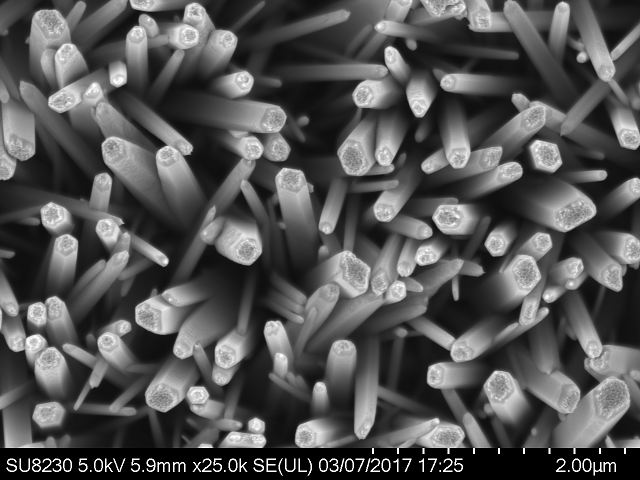 ZIF-7 has the potential to dramatically reduce the energy cost of purifying difficult-to-separate light gases such as ethane/ethylene or hydrogen/methane. 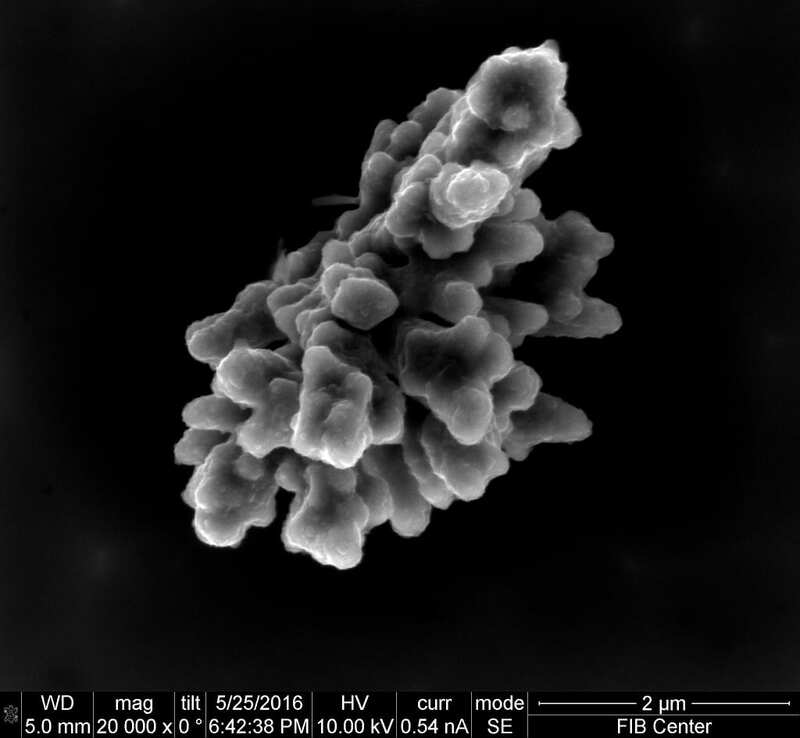 By producing monodisperse particles, we can more accurately study the diffusion of these kinds of gases into ZIF-7, allowing for better development of parameters to optimize separations. 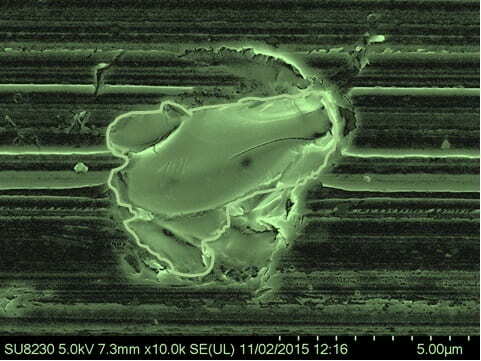 This image of a frog on a sidewalk – as if it made an imprint in wet cement is actually the surface morphology of a silicon wafer sliced by fixed abrasive diamond wire. 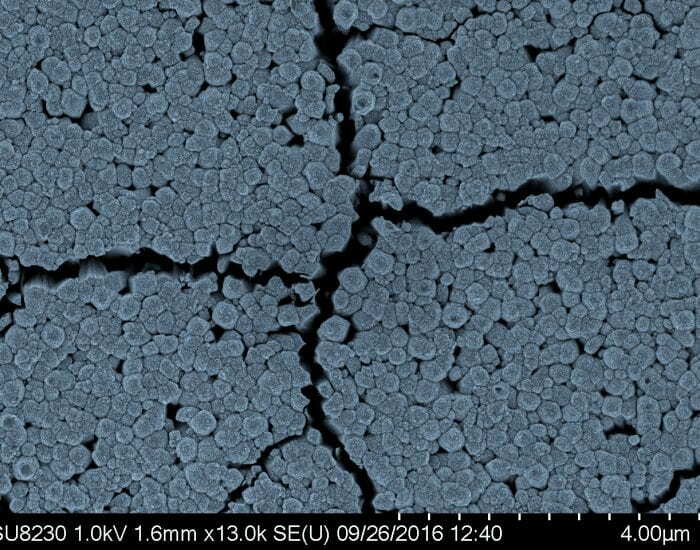 We are investigating the surface damage in Si wafers caused by dicing with grits of different sizes and shapes. 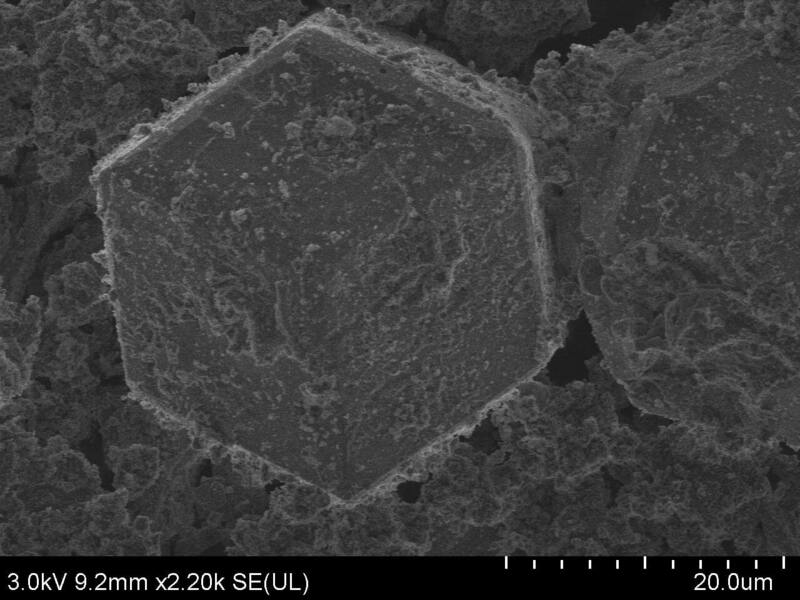 Beginnings of Hydrated CSA cement structure: Only thirty minutes after initial contact with water, the formation of ettringite crystals, which form the hardened crystal structure of a hydrated calcium sulfoaluminate (CSA) cement, begins. 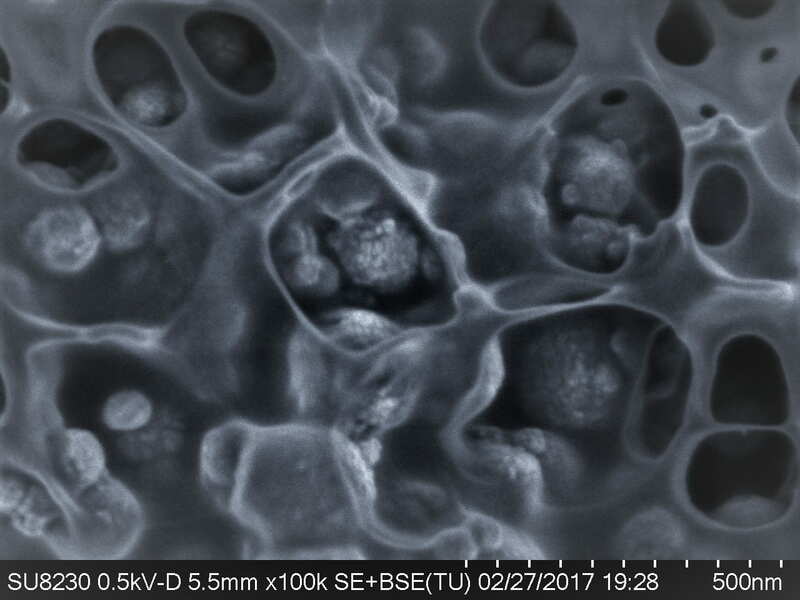 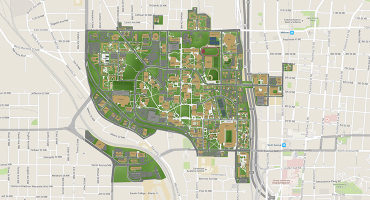 CSAs are a greener alternative to portland cements, but many aspects of their hydration, structure, and performance are not yet well understood. 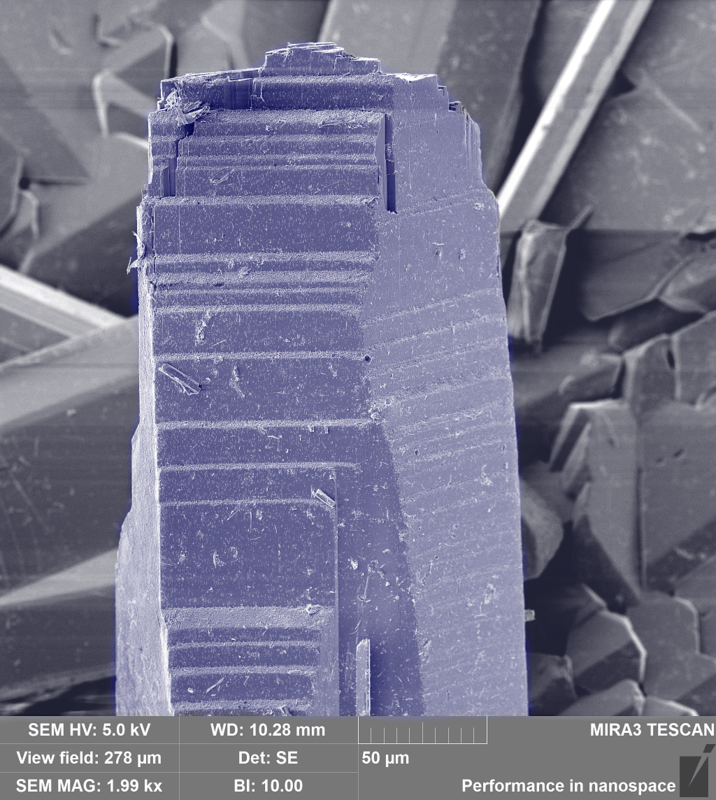 By increasing our knowledge of these materials at microstructural levels we can optimize their usability and durability while at the same time decreasing the environmental footprint of new construction. 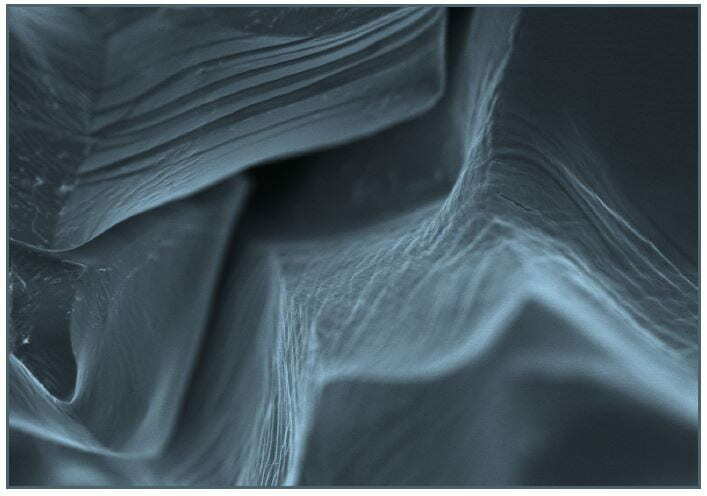 Nickel-based superalloys contain several alloying elements to optimize their high-temperature performance in gas turbine engines. 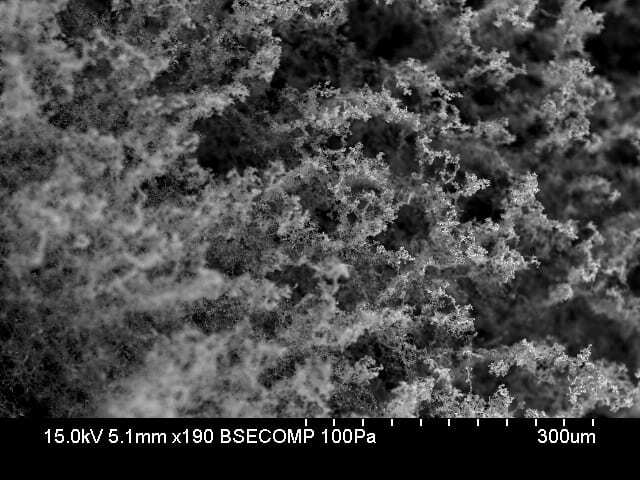 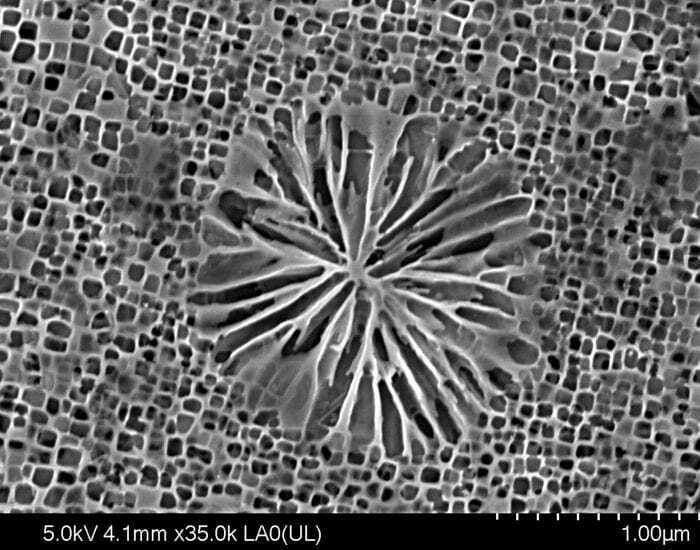 This image is obtained for René 142 additively manufactured using a Scanning Laser Epitaxy (SLE) process currently being developed at Georgia Tech. 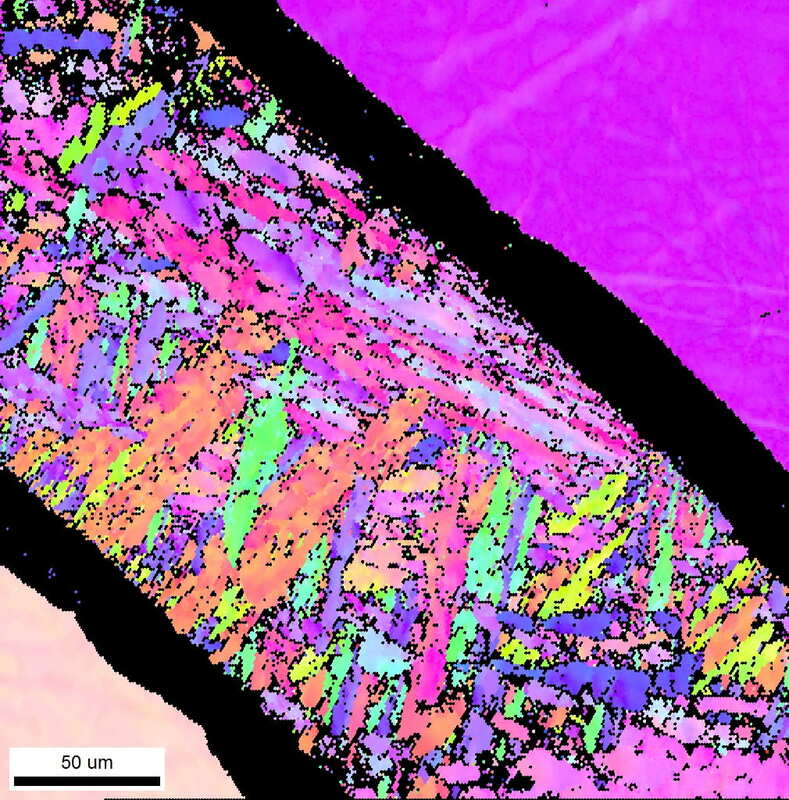 During melting and re-solidification, the alloying elements segregate and create fascinating microstructural features such as these eutectic pools. 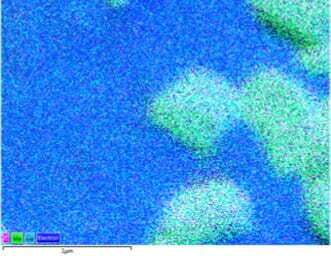 Studying these pools is necessary to eliminate them in the final product as they reduce component life. 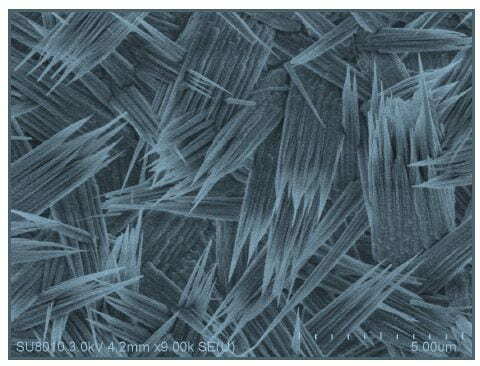 The TiO2 nanowires were grown on FTO conductive glass under varying conditions. 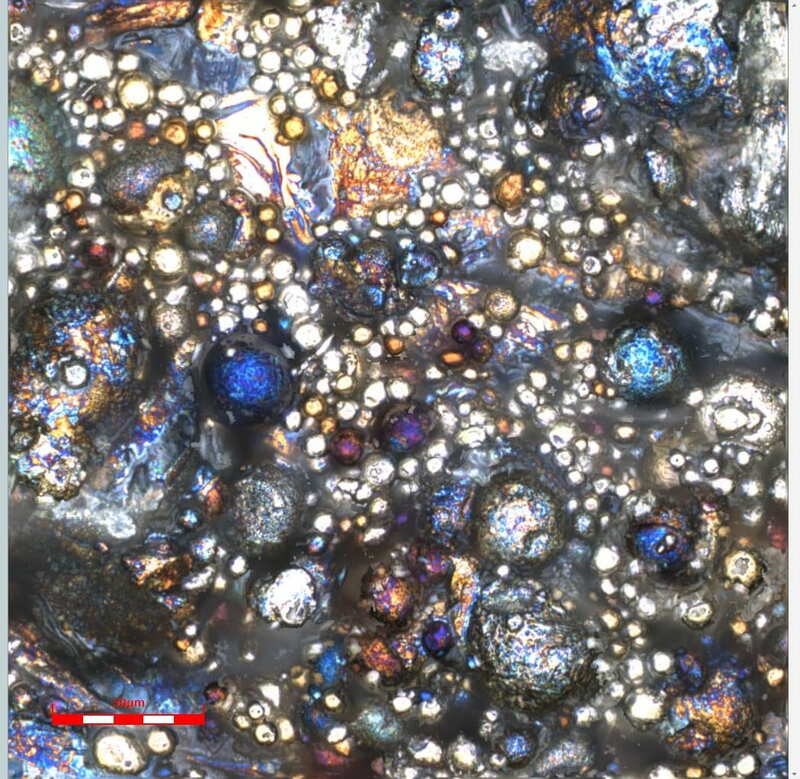 The glass was submerged in solution and heated in an autoclave for a range of two to 8 hours. 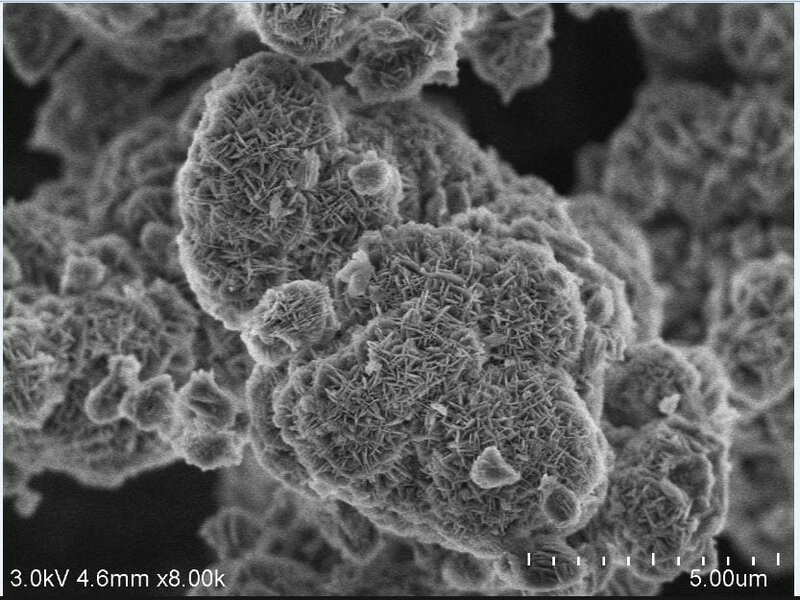 While the length of time in the furnace was altered, changes were also made to the concentration of titanium butoxide used in the original solution. 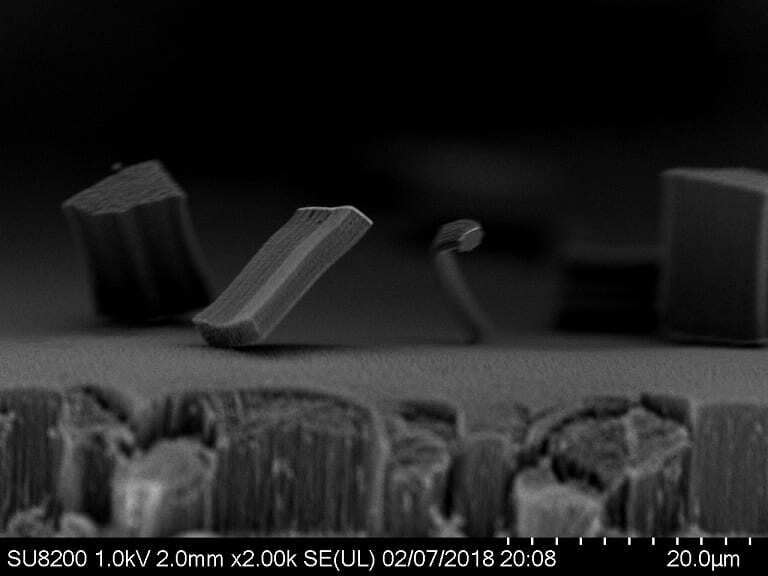 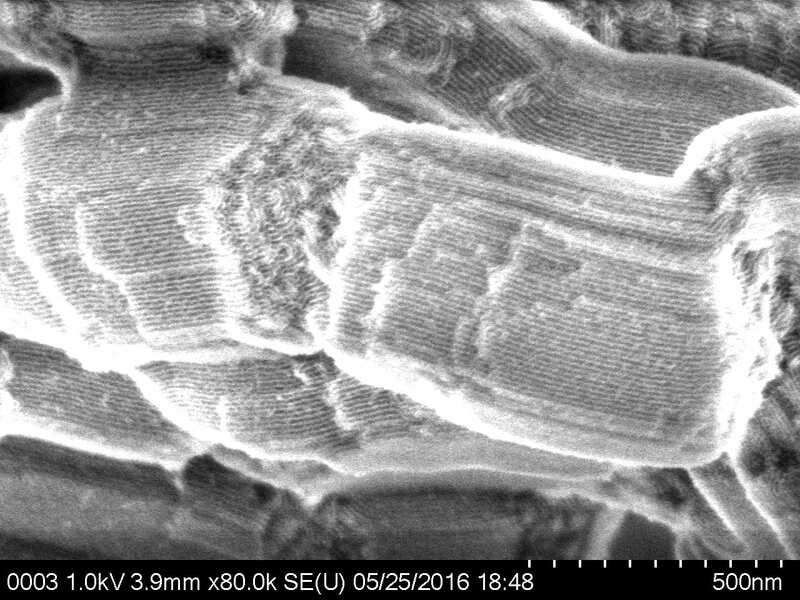 Through the use of SEM, we were able to determine which conditions yielded nanowires with both desired length and density. 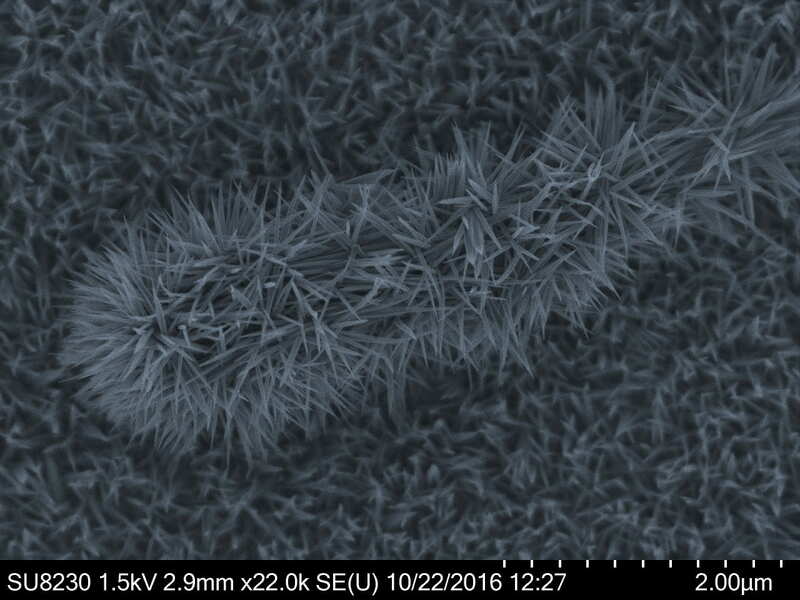 In the future, optimized nanowires will be used in photoelectric devices. 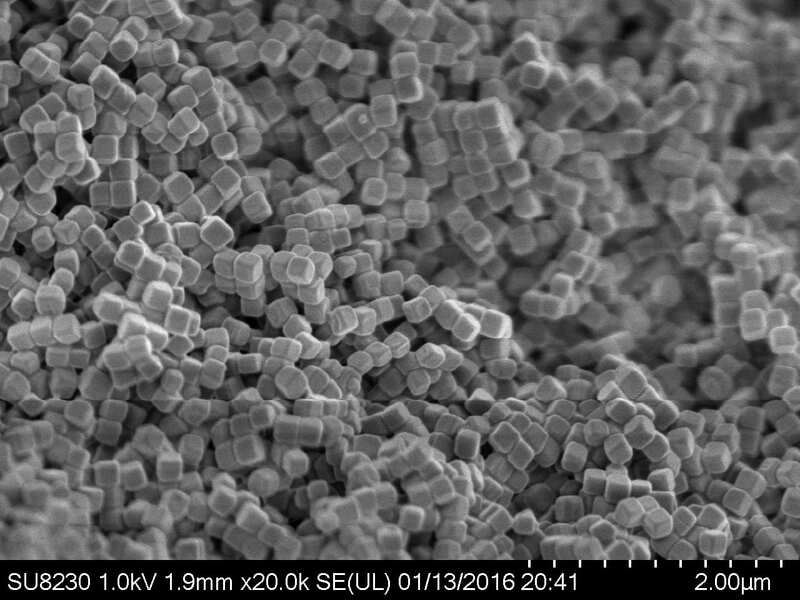 ZIF-8 is a metal-organic framework with internal surface area of 1400 m^2 per gram. 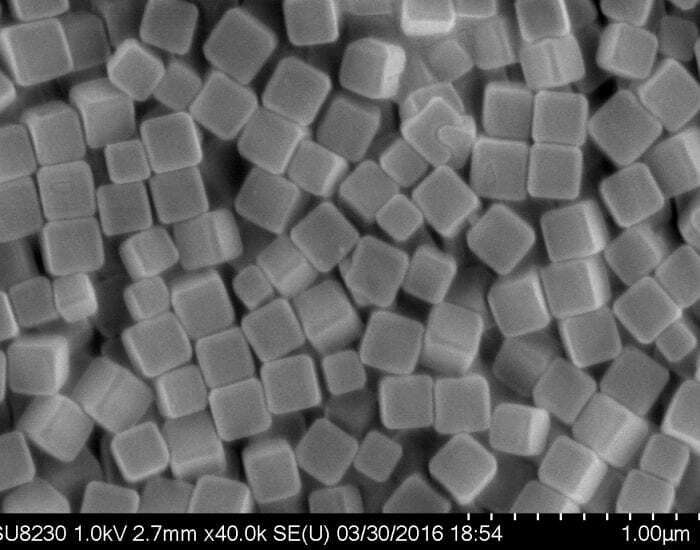 These nanocubes have greater resistance to degradation under acidic conditions due to their specific surface facet termination.